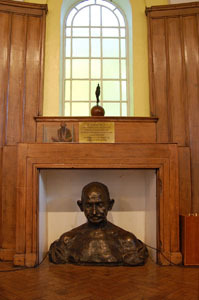 The 2007 Gandhi Foundation International Peace Award was presented to Media Lens. 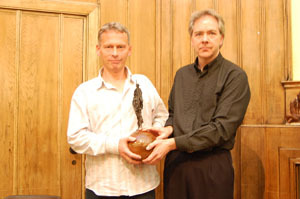 Media Lens (www.medialens.org) is an online, UK-based media watch project, set up in 2001, providing detailed and documented criticism of bias and omissions in the British media. 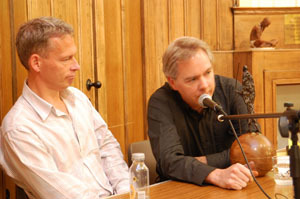 David Edwards and David Cromwell are co-founders and co-editors of Media Lens. 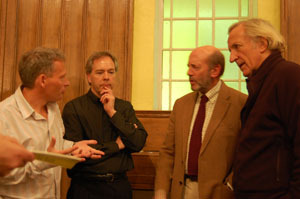 Media Lens is an online, UK-based media watch project, set up in 2001, providing detailed and documented criticism of bias and omissions in the British media. Through their free email Media Alerts, they provide detailed analysis of news reporting in the UK media, concentrating on the ‘quality’ liberal print and broadcast media. Their aim is to expose bias, inconsistencies, inaccuracies, omissions and untruths. They challenge journalists and editors by email and invite their response. 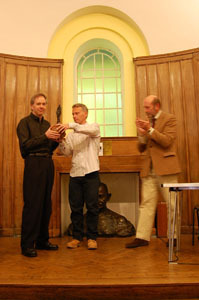 It’s a real honour to accept the 2007 Gandhi Foundation International Peace Award. It seems amazing to us that an idea which developed over a couple of pints in the Giddy Bridge pub in Southampton has led to us being considered in the same company as Denis Halliday, for example, who accepted this award in January 2003. My co-editor David Edwards interviewed Denis Halliday, the former United Nations humanitarian coordinator in Iraq, in May 2000. Halliday explained how US-UK sanctions on Iraq were responsible for what he described as a “genocide.” The sanctions directly contributed to the deaths of around one and a half million Iraqis. That dreadful death toll includes half a million children under the age of five. 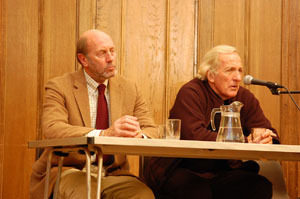 Halliday exposed the deceit behind British and American claims that the Iraqi government had been stockpiling food and withholding medicines from its stricken people. covered that subject” in an article before – once! The indifference and cynicism were astonishing. It gave a snapshot of a media system utterly lost to cynicism and servility to power, even in response to a completely credible claim that our government was responsible for nothing less than genocide. This was one of many experiences with the media that we both had that led to the creation of Media Lens in July 2001. Our aim is to draw attention to silences like the one I’ve just mentioned: to highlight what credible commentators like Denis Halliday say; to show what journalists have said on the same issues; and to ask those journalists why they have neglected so much that is true, relevant and important. When so much of the public is alienated from politics and politicians, we believe the internet provides a tremendous opportunity for the public to get involved in matters of vital importance, and to debate these issues with journalists. So, at the end of each media alert, we add the email addresses of the reporters and editors whose work has been discussed in that alert, and we ask readers to send polite, rational challenges to them. After the invasion of Afghanistan in 2001, for example, we invited readers to ask Guardian journalists why they had so little to say about the 7.5 million Afghans who were starving even before Britain and the United States started bombing – bombing that instantly stopped all aid convoys. We noted that Maslakh refugee camp in Afghanistan contained 350,000 refugees where one hundred people were dying every day in January 2002. We asked why, between September 2001 and January 2002, the Guardian and the Observer had mentioned the catastrophe at Maslakh just five times. Later, we asked why, by May 2005, Maslakh had been mentioned only twenty-one times over the previous four years in all UK national newspapers. Or take Iraq. In the run-up to the invasion in 2003, we repeatedly pointed to the neglected testimony of the former UN chief weapons inspector, Scott Ritter. He had reported that by December 1998, his team had destroyed “90-95%” of Iraq’s weapons of mass destruction, including 100% of its nuclear capability, leaving it “fundamentally disarmed” with only “bits and pieces” of programmes left. We asked why, in 2003, the Guardian and the Observer mentioned Iraq in a total of 12,356 articles, but Ritter was mentioned in just 17 of them. We asked why the media failed to question seriously the state of any retained Iraqi WMD. According to CIA reports, any WMD would, given its limited shelf life, have long since turned to “sludge”. Sad to say, the BBC has been as shameful as the press, if not worse. Its channelling of government propaganda on the illegal and immoral invasion of Iraq, and subsequent occupation, has been relentless. Iraqi deaths as a result of the war. BBC’s Newsnight was a rare exception in reporting the results of the ORB survey. In a brief news roundup, it devoted 34 seconds to those 1.2 million deaths. But then, this is the usual media standard for reporting the crimes of +our+ government: either silence or relegation to the margins. Esler’s response to the public’s challenge was ironic on more than one level. Rather than sending out “robotic responses” following our media alert, our readers had, in virtually every case, written individually crafted, articulate emails. tell, not one journalist at the BBC has ever put it to Blair, Bush or their accomplices that, by the standards of Nuremberg, they would have been found guilty of the supreme international crime.This is just a taste of the appalling media coverage on Iraq. “humanity’s loudest warning yet of the catastrophe that is threatening to overtake us”. of the Independent – like all the other newspapers that day and, indeed, every day – was crammed with the usual inducements to indulge in unrestrained consumerism. The positive results of media activism are not always easy to assess. In this case, however, discussion +has+ been kick-started as a result. In October, for example, the Guardian readers’ editor wrote a column discussing George Monbiot’s calls in the same paper for newspapers to abandon the worst fossil fuel advertisers – Monbiot had been responding to criticism from Media Lens readers on this point. “you have begun to force people working for newspapers and broadcasters to look over their left shoulders as well as their right,” which he described as “a major service to democracy”. criticism with anger and hatred. Gandhi said that: “Nonviolence is the greatest force at the disposal of mankind.” He was as right as he was misunderstood. In truth, non-violence does not merely mean to refrain from hitting someone over the head. It does not even mean restraining one’s anger – although both of these are admirable. Genuine nonviolence is rooted in a deeply-held conviction that the suffering and happiness of others are of equal importance to our own. By sheer force of arithmetic, it goes further still in asserting that the suffering and happiness of 10, 20, one million other beings, are far more important than the concerns of this single individual I call ‘me’. How many of us compromise what we do in our careers – for example, as journalists or in any job – out of concern for our own financial security, out of concern for our immediate families? Of course, these matter. But do they matter most, if the consequence of our compromise is death and destruction for millions of people, for example in Iraq? Does our responsibility rest solely in taking care of those who share our DNA and who, let’s be honest, provide us with our security and happiness? How do we escape from the cosy conceit that we are good people because we are taking care of ourselves and our loved ones – from the conceit that this is enough? According to Buddhism, we can do so by reflecting strongly on the similarity between ourselves and others. Fundamentally, we all wish to be free from suffering; we all wish to be happy. By focusing repeatedly on the suffering of others, we can increase our sensitivity to the reality of others who suffer and yearn for happiness from the core of their beings, just as we do. This is the true basis of compassionate action. With diligence and time, we can come to find the suffering of a sick child in Baghdad quite as unbearable as the suffering of our own children. This is hard. In fact, it as an Olympian feat, and we are all beginners. But even a small success, even slightly increased compassion for others, strikes a blow against the forces of selfishness, greed and hatred that have always tormented our world. These forces are the real enemies; the real causes of the darkness that weaves what James Joyce called “the nightmare of history”. Compassion is a gleam of light in that darkness – a source of hope, and in fact a promise, that humanity will one day wake up!